It's time to tune into your favorite soap opera As the Reels Turn. Click here to play! In this episode, �I Can't Afford a Friend in the World', you'll get stuck into the lives of everyone at El Paradiso Casino. Stay tuned through the entire episode and you'll see yourself winning a fair amount of cash! Keep an eye out for the Don in this TV show. Spin two to five of this daytime villain across a pay line and you'll bring in up to 300 coins. The same goes for Matt G and Chrissy. Watch out for the confidential envelope to make an appearance. Not only does it hold a critical secret, but it may be the key to all of your winnings. Spin three to five of this symbol and you'll take home up to 100 coins. The same can be said for lobster dinners and wine bottles. But the real pay offs come when you catch the El Paradiso or money stack jackpots. Two to five of either of these symbols will get you up to 1000 times your line bet. There are plenty of shocking surprises at El Paradiso Casino so be sure to keep an eye out for them. Tommy W or Ivan act as scatters. You'll also want to spin the bonus chip to trigger the bonus round. But, the Advance to the Next Scene icon is key in this unique game. Spin three of these to make your way through the episode. The best part is you can determine the outcome of the story by the selections you make in each scene. So turn on the tube for another captivating episode of As the Reels Turn. 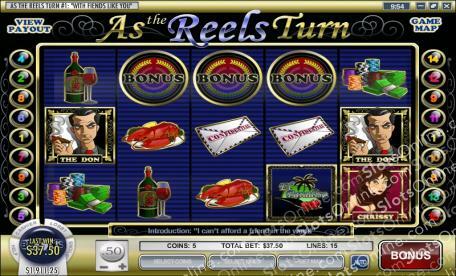 There are a few different scatter symbols in this game, including the bonus chip, Tommy Wong and Ivan The first two will trigger bonus games when you spin three or more on the board. Spin three or more Ivan symbols and you will be given a number of free spins in which prizes are tripled. There is also the Advance to the Next Scene icon. Spin three or more of these to advance the game through each scene. You will be allowed to influence certain aspects of the story based on your selections in each scene. bonus. If you spin three or more it will trigger a bonus round in which you must choose from a selection of casino chips to win bonus cash. Your game ends if you choose the fake chip. The second bonus icon is Tommy W. Spin three or more of this Elvis impersonator and you will trigger the Tommy Wong Bonus Feature. During this feature you will have to choose from a selection of Tommy Wongs. The audience's appreciation will deterimine your bonus prize. These two symbols will also multiply your total bet by up to 50 times.